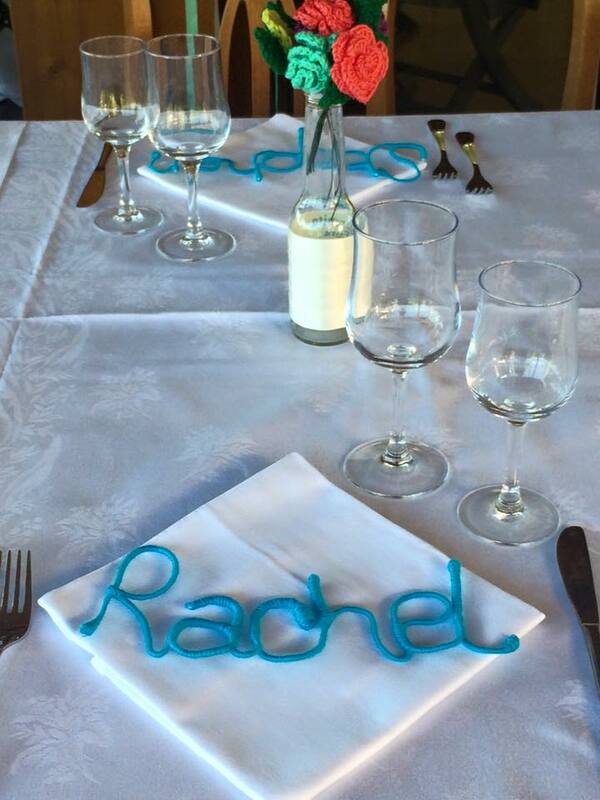 Continuing the theme of homemade wedding crafts, I made all my placenames. I wanted to continue the use of wool as I love knitting and thought it would make them a bit more individual. Everyone ended up taking their own home so they also acted as favours. Thankfully there were only 28 of us as this was a very time consuming task. I bought some 1.5mm wire from ebay, ending up using alot more than I thought I would (probably 30-40m. I used wire cutters from Tiger (about £2 and absolutely all I needed) and some pliers from a toolkit from Ikea, proving you don’t really need anything too expensive or specialist. I first created the words. These were all made out of 1 piece of wire looped around in the most appropriate way. To start I used the plier s to loop the end of the wire back on itself. This gave me a little bit to help trap the wool when I wanted to start wrapping. Not essential, I just found it helpful. I then just looped the wire around to make the letters. The R in the above for example I looped the wire up and wound on itself to make almost a P shape. I then used the pliers to make a pointier edge before pointing the wire back down again to make the bottom of the R.
There were a few names where I couldn’t quite get the feel of how the letters should loop or join properly so either wrote them all out to check or typed them into the computer in a handwriting font to sense check. To finish the name I also turned the end of the wire back on itself as I did with the start. To wind the yarn round I wound up and created smaller balls of wool as these were easier to work with. I put the end of the wool through the 2 bits of wire to begin with then used the pliers to sandwich these in. I used a hot glue gun to make this stick and before it dried I wound the wool round it multiple times. I found that putting a bit of vaseline on my thumb and forefinger made this a bit more painful. I wound round to ensure that the wool was through the glue and therefore secured. I let it dry a bit and then continued to wind round to avoid being able to see any of the wool. I then commenced winding up the wire. You’ll probably find that you need to tighten and readjust the wool as you go. You may also need to do more hot glue at ccertain intersections. There will also be times where you have to go back over yourself with the wool in order to make a loop. This makes the usage of wool uneven across the names but i thought this added to the effect. If I needed to change wool half way through I did so at an edge to a letter rather than in the middle. By this I mean in an i for example I would change the wool at the top of the i. I used the hot glue to secure both ends. I did pretty much just make up what I was doing rather than follow anything. It took about 30 mins to an hour to do the wiring for each one and then a further hour to 2 hours to wind the yarn around so this is a time consuming job. However I was really pleased with the result and thought they looked great!